Summary: ENHANCED category. 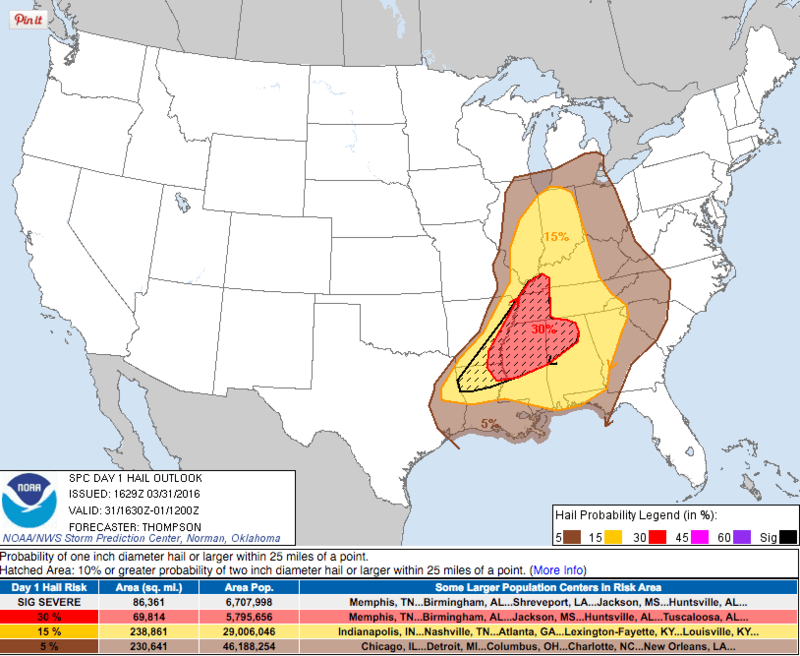 All modes of severe weather possible, with damaging winds and large hail being the primary threats. A few tornadoes are possible. 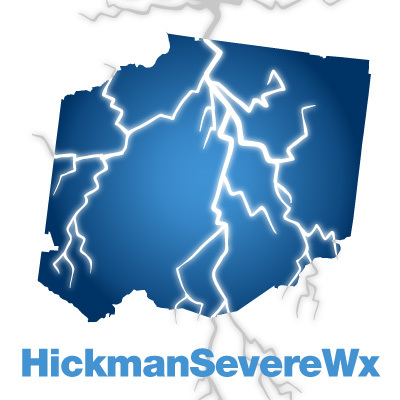 Note: follow us on Twitter @HickmanSevereWx for the latest info. Will do our best to update this post as possible, but understand that we will likely get busy and won’t have a chance to. All updates will be noted and timestamped. 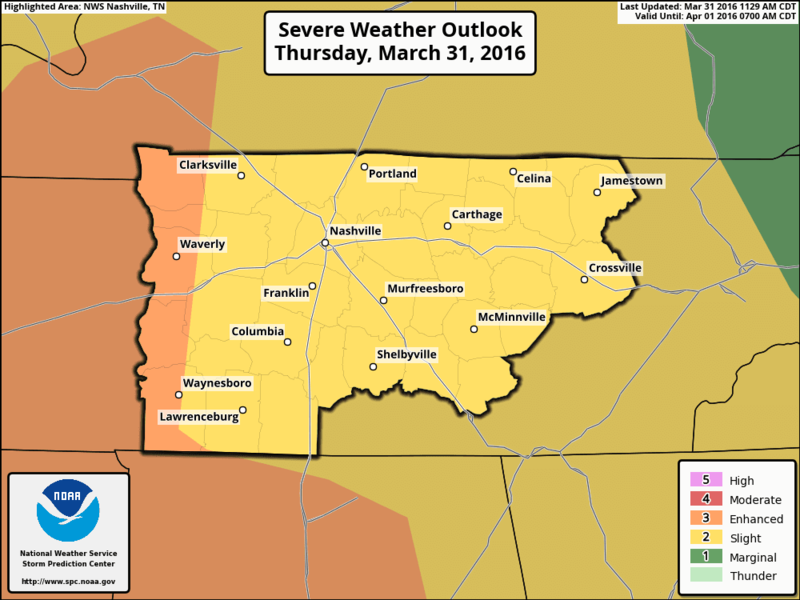 Updated 11:45am 3/31/16 – New SPC outlooks put us in the SLIGHT category, but not by much. 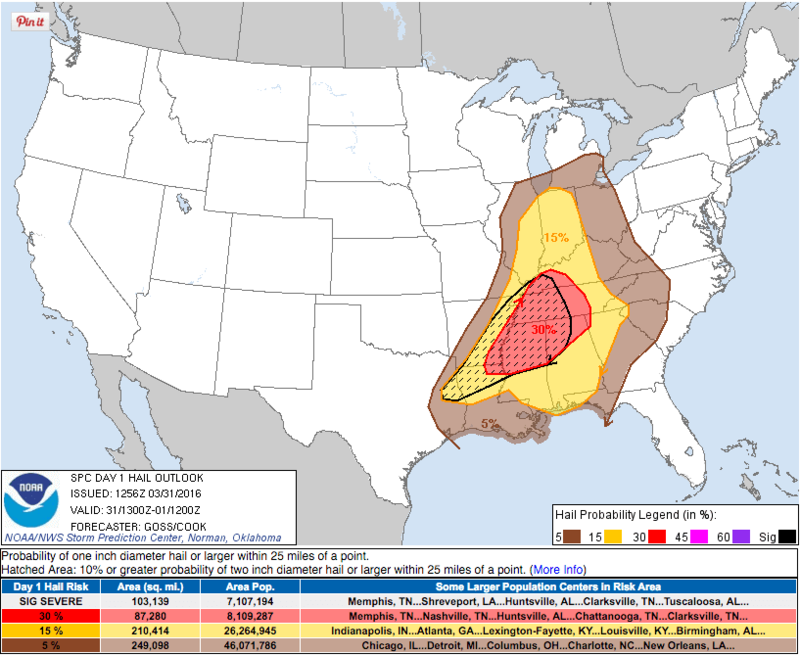 Also new outlooks for tornadoes and hail; wind outlook remains unchanged. Below are the new outlooks. Timing estimates have also been accelerated slightly. Tornado outlook. Now we are in the 5% chance of seeing a tornado within 25 miles of a point. We were removed from the yellow (10% chance) and hatched area (10% or greater chance of seeing a EF2 or more). Hail outlook. We’re now in the 15% chance of seeing one inch diameter hail within 25 miles of a point. We were removed from the red (30% chance) and hatched (10% or greater chance of seeing two inch diameter hail) area. Timing. Models are trending toward earlier arrival of the storms. 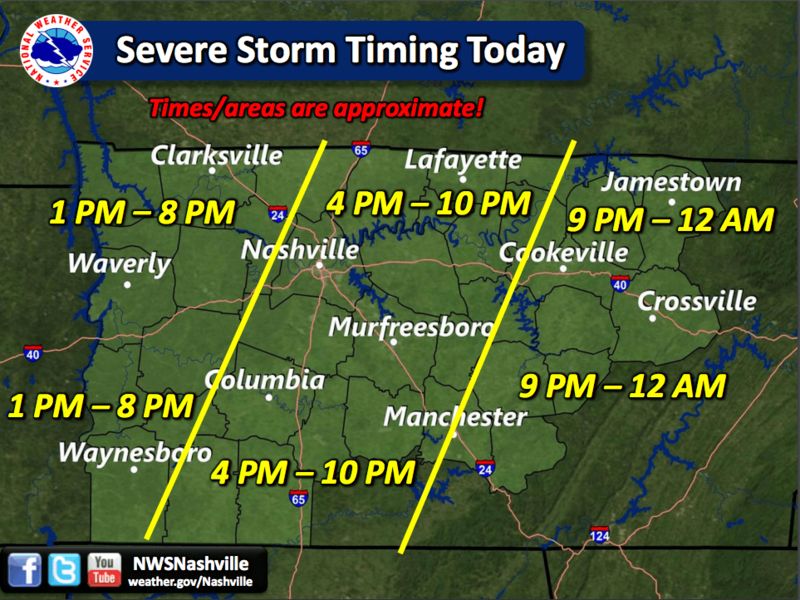 NWSNashville updated their latest thinking. Original Post – Some of this may be outdated. Look above for updated info. 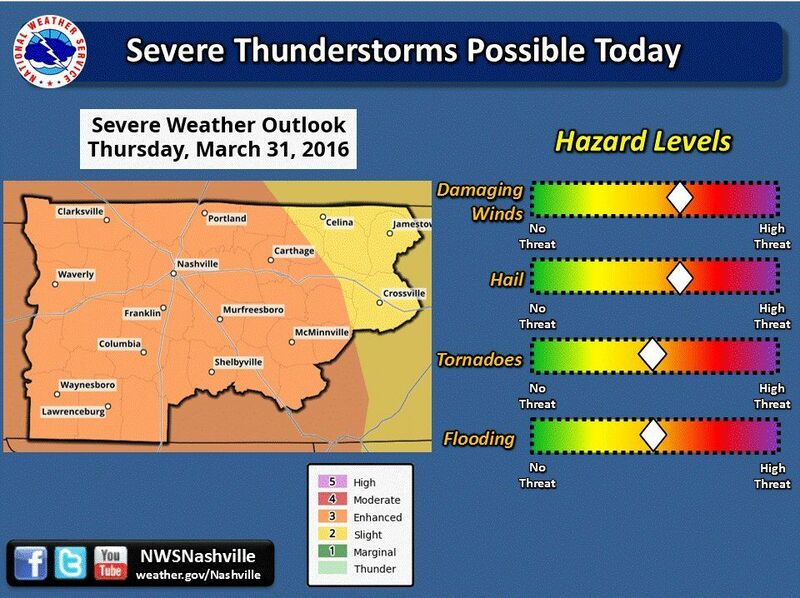 Today we’re under an ENHANCED category for severe weather from the Storm Prediction Center. The main threat is damaging winds and large hail, but a few tornadoes are possible as well. Flooding is also a threat due to the heavy rains we received overnight already saturating the grounds. With the ENHANCED category comes specific probabilities of hazard types. 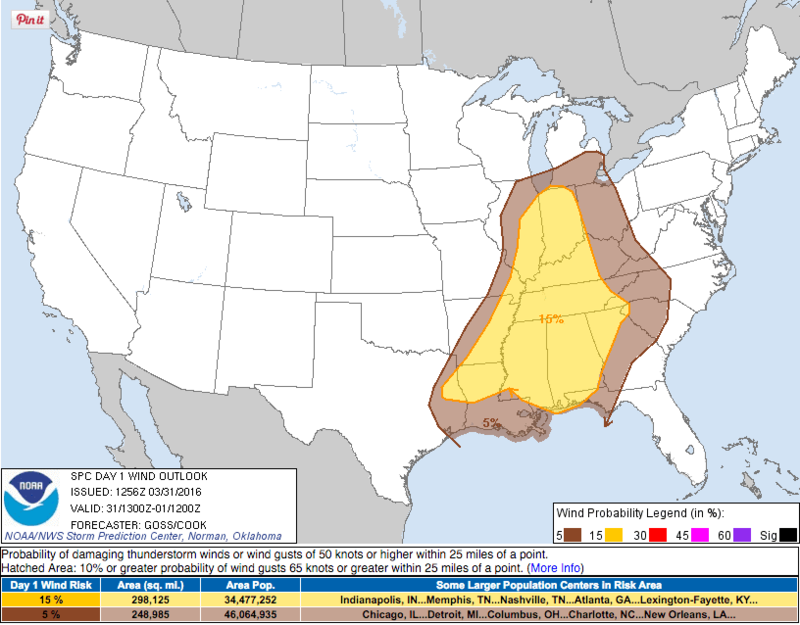 First up: the SPC gives us a 15% chance of seeing damaging winds in excess of 58 mph within 25 miles of a point. 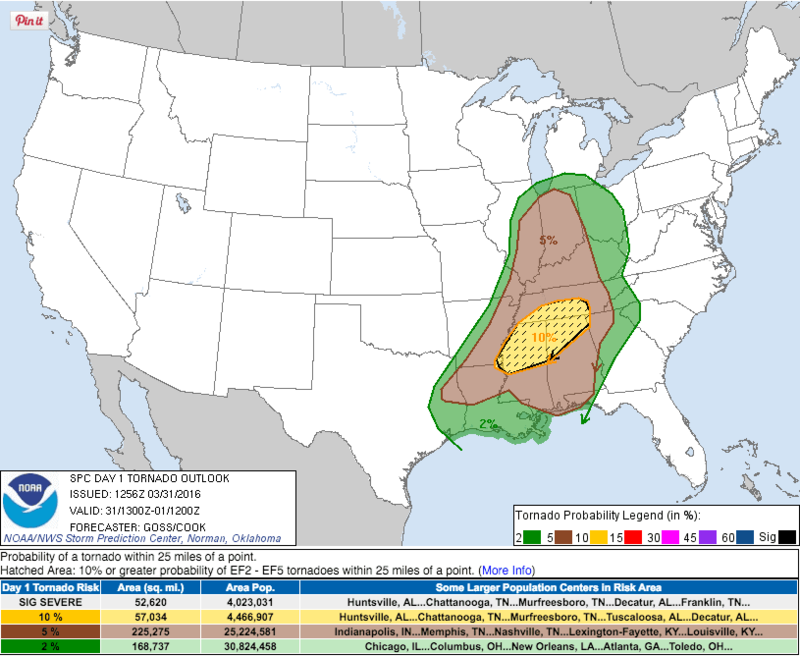 Pretty much all of Middle Tennessee is inside of this 15% probability. Next up is hail. The SPC has placed us within a 30% chance of seeing hail one inch in diameter or greater within 25 miles of a point (red area). Not only that, they’ve also placed us inside of a 10% hatched area, which means we have a 10% or greater chance of seeing hail two inches in diameter or greater. 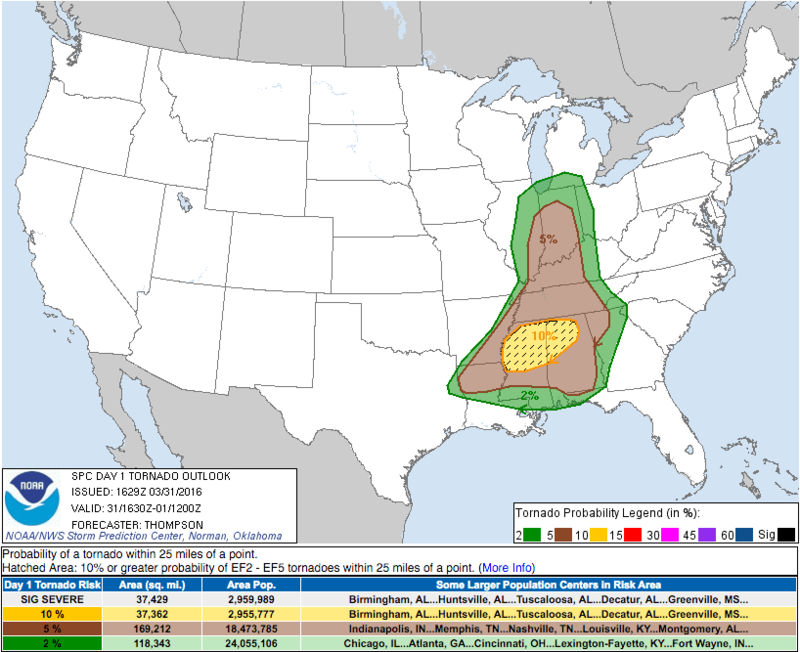 Finally, the tornado probabilities give us a 10% chance of seeing a tornado within 25 miles of a point. Hickman County is placed right inside of the hatched area, which means a 10% or greater chance of seeing an EF2 tornado or stronger. 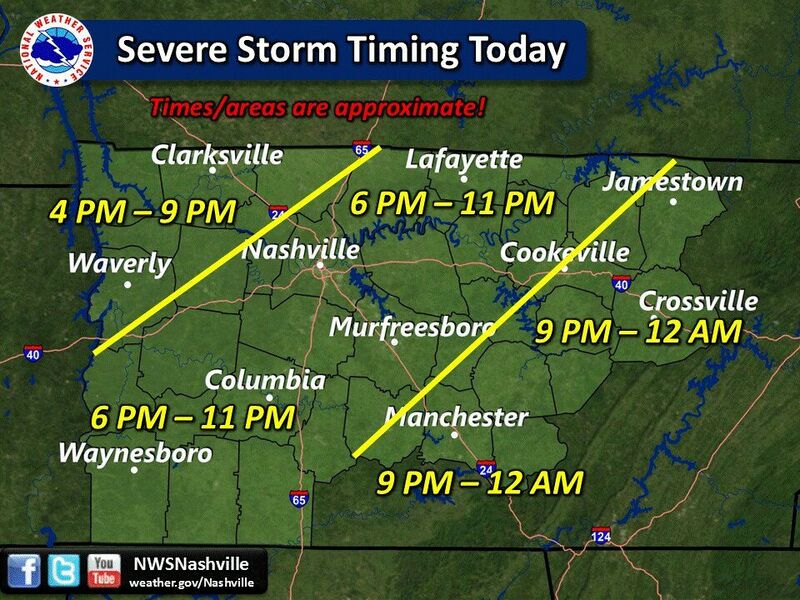 The timing for the severe weather is as follows (these are ESTIMATES). Rain is currently moving out to our east from overnight. Behind that we expect that the clouds will part, allowing some sun to heat up the atmosphere, causing it to be unstable. If the atmosphere is able to juice back up (“recover”) with CAPE (measure of moisture and instability), then that gives the incoming cold front a chance to generate some strong to severe storms out of the CAPE. If this happens, we will likely see a line of storms or some supercell activity in the late afternoon. If you’ve lived in Mid TN for a couple of years, you know that late afternoon and evening storms are often the strongest, since it has had all day to feed off of the sun-heated atmosphere. Here’s what the HRRR has to say, which is current as of this writing. The HRRR is updated every hour, so this will change several times today. It points out less of a line of storms and more of clusters of storms. It also shows CAPE a bit higher than the NAM4 below at about 2300 j/kg. 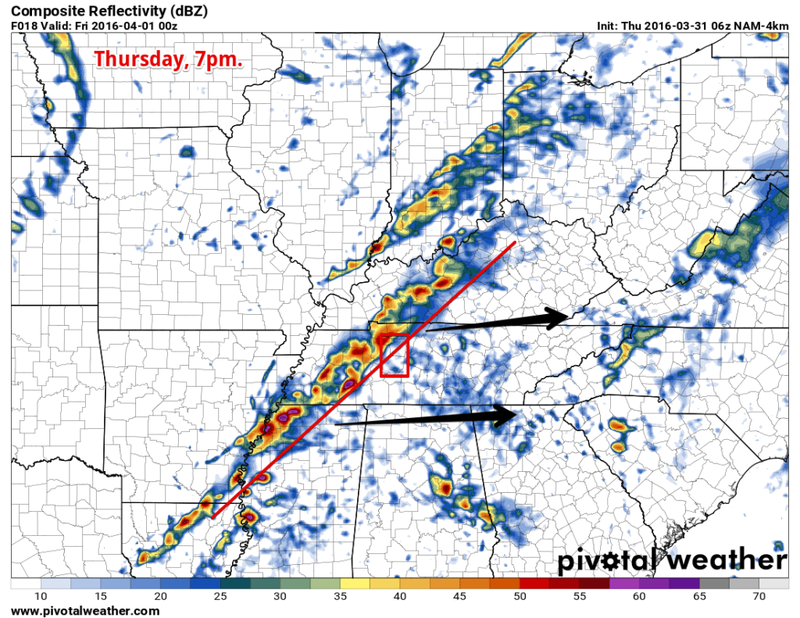 The NAM4 shows a line of broken storms coming through around 7-9pm for us, and shows these storms as fairly strong. CAPE around this time is expected to be about 1750 j/kg, which is enough to get the storms going. The GFS is pointing to a little less CAPE than the modes above, showing about 1300 j/kg. Which is a good thing for us who don’t want to see any storms. All of the models do show that some of these storms could be supercells. If that is the case, the chance of seeing a tornado from them is higher. If the storms form a line, even a broken line, then the storms will feed off of each other, but will have a harder time rotating (but not impossible). We hope and want this forecast to bust. If we want no storms to develop, these two things need to happen. 1.) We want cloud cover to hang around as much as possible today, especially after this morning’s rain. This limits the sun’s potential to heat up the atmosphere and “recover” or juice back up to give fuel to later storms. 2.) We want storms/rain to be going on in Mississippi for most if not all of the day, so that it can cut off the flow of moist warm air coming from the Gulf of Mexico. Cutting off this flow will help limit the instability in the atmosphere for storms here to feed off of. Every weather nerd and meteorologist always wants a forecast and an event like this to “bust” or turn out less than what was advertised. So while we hope for this, we also must get the word out and prepare in case it doesn’t. Stay weather aware today: stay close to a weather radio and/or trusted source for weather (local news stations, radar on the internet, NWSNashville). If and when any warnings are issued, take them seriously. Read on our site: What to do when Severe Weather is forecasted.